In the days leading up to the US team’s opener against England this weekend, America has never been more excited about the World Cup. To fuel that fire, Intertops Sportsbook is offering a chance to win $100,000 by correctly predicting the winners of all 64 matches, or a trip to the Super Bowl just for placing a World Cup Wager. While Americans may be rooting for their team, Intertops’ bookmakers favor Spain (+350), Brazil (+450) and England (+600) to take the World Cup home from South Africa. Picking 64 winners may be a challenge, but entering Intertops’ World Cup Bracket is easy and doesn’t cost a cent. 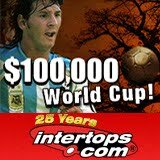 Registered Intertops players can just go to www.intertops.com/worldcup2010 to click on their selections. Entering to win a trip to next year’s Super Bowl is even easier. Every dollar wagered at Intertops Sportsbook on World Cup matchups earns one ticket in their draw for a luxury trip to Super Bowl XLV in Texas. The prize includes luxury hotel accommodation and 2 top tickets to see the game at Cowboys Stadium. Odds for every World Cup match, from the South Africa vs Mexico game that begins the tournament to the final game, are posted at Intertops.com. Intertops, which was the very first to take online wagers and continues to be one of the most popular and trusted betting sites in the world, is also taking bets on who’ll make it to the Quarter Final, Semi Final and Final, on the Total Group Score, on the stage of elimination of each team and much, much more. Spain’s David Villa (+800), Argentina’s Lionel Messi (+900) and England’s Wayne Rooney (+900) are favorites to take Top Goal Scorer right now, but Intertops will update those and all other odds on a daily basis. All World Cup odds quoted are as of today and are subject to change.